I'm always talking about food, aren't I? I can't help it. I'm a foodie. So let me tell you about today's lunch. I went to a Carribean place called Mami's (Heredia Centro, 50 mts. Sur de la Cruz Roja) and had their specialty: Rice and Beans. Carribean "Rice and Beans" (they use the English words) is different from Costa Rican "gallo pinto" or "arroz con frijoles." Instead of being seasoned with cilantro, onions, and Salsa Ingles, they use jerk spices and cook it in coconut milk. It's a unique flavor. It even has a little kick. They serve it like a casado, so it came with a cabbage salad, beet salad, patacones (sliced green plantain that's smashed then fried, like a thick chip), and a meat (I had a pork chop - also with jerk seasoning). And to drink I had a pineapple fresco. My tongue was delighted by the new flavors. It was all so, so good. And cheap, too (under 5 bucks). Don't get me wrong, I love the typical Tico cuisine. But some variety is always nice. And if I can get Carribean food that's this good in Heredia, I can't wait to actually visit the East coast and try the real deal. I've also been getting away from the supermarkets and trying to buy more from the mercados (central markets) and street vendors. The Supers are okay for some things (milk, rice, beans, beer, etc), but the mercado and street vendors have a much better selection of fruits and veggies at cheaper prices. My problem is they require much more speaking (it's easier to fill a cart, unload it on a counter, and read a register for the total cost). I have to ask how much things are, tell which things I want, and make sure I pay the right amount. But I'm getting better at it. Below are some pics from my most recent purchases. 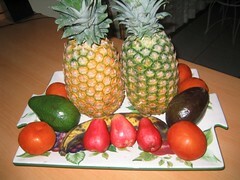 I got avacados, tomatoes, plantain, and water apples from the mercado. 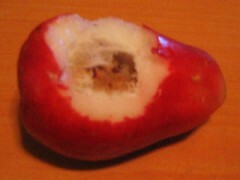 Water apples (manzana de agua) look like little red pears, but taste more like apples, and smell like roses. And I got two huge pineapples from the guy that sells fruit out of the back of his truck near my home bus stop. Each time I buy from him, he gets friendlier. This time, he was packing up for the day, but he gave me a big smile, handshake, and stopped to ask me if I was from the United States and if I was working here.